No doubt about it. Our students all learn at different rates, based on their diverse abilities, learning preferences, and academic backgrounds, which is a real challenge for even the most seasoned educators. But using the latest “smart” technologies, the learning assessment company, Cognii, has developed a customized and cost-effective, virtual solution that empowers students of all ages to master and retain difficult concepts at their own pace and on their own terms from wherever they live and learn. 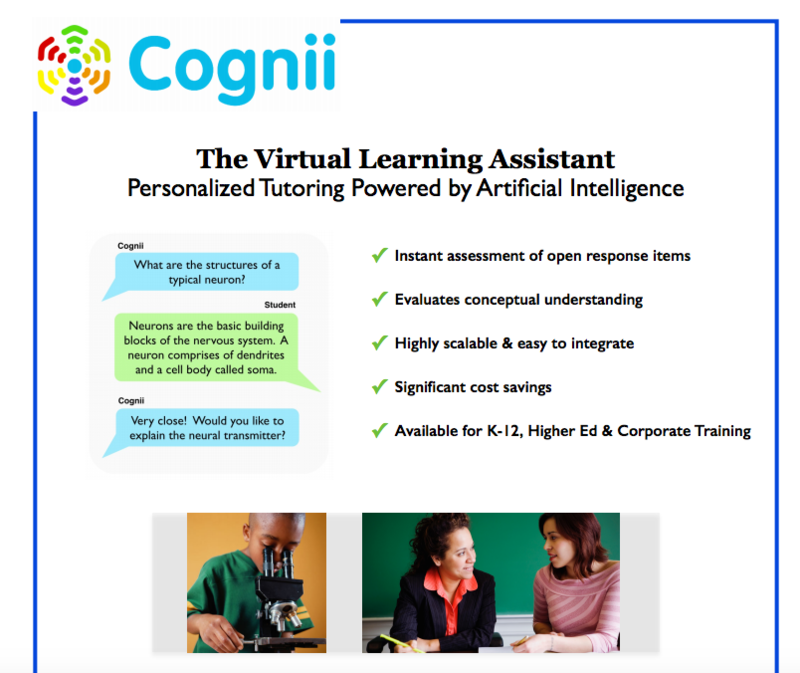 Working with educators, subject matter experts and course designers, Cognii developed its Virtual Learning Assistant, or VLA, with two objectives in mind to help students feel more successful and educators, more productive. Using advanced artificial intelligence, natural language processing and cognitive computing technologies, the VLA provides interactive, one-to-one tutoring, open response assessment and immediate feedback, all of which are proven strategies for promoting active learning and deeper engagement. Likewise, based on learner response, this computer-generated instruction is automatically and progressively customized to ensure that each student achieves mastery regardless of the concept or problem at hand. Cognii’s VLA is not only a valuable tool for students; it also offers numerous advantages for faculty. To begin with, it greatly reduces the need for coordinating face-to-face remedial interventions that are both time-consuming and hard to scale. Instructors can also access an administrative dashboard that enables them to monitor each student’s progress while identifying collective trouble spots that suggest adjustments or enhancements to the curriculum. Equally impressive, this Virtual Learning Assistant can grade a large number of short essays within a few minutes, another time-saving benefit. Now that its VLA is up and running, Cognii is partnering with Learning Management System companies and educational publishers, as well as a few prominent colleges and universities, which report student satisfaction rates upwards of ninety-five percent. What’s more, going forward, the company hopes to provide its groundbreaking virtual solution on a wider scale particularly in geographic locations where there is a shortage of well-trained teachers. 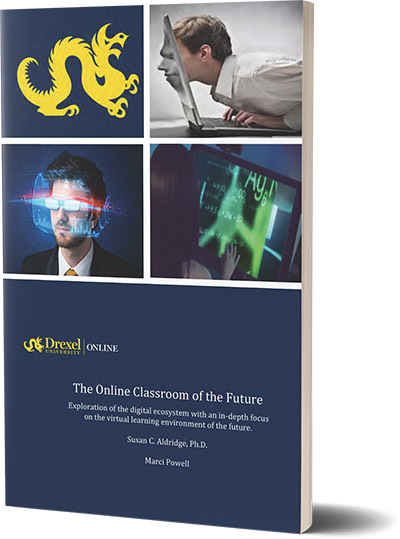 As Artificial intelligence (AI) develops into a leading trend in education, it is becoming more readily integrated into higher education at both the institutional and course level. A recent analysis of the artificial intelligence (AI) market in the United States education sector alone predicts a compound annual growth rate of 47.5 percent throughout the 2017-2021 forecast period. 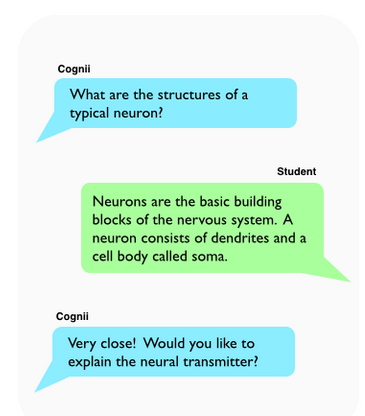 One of the most common types of integration is through the use of chatbots for encouragement, reminders, and prompt assistance to help students stay on track. It is also being used for monitoring class discussion boards for inappropriate comments. Some universities are using it to handle frequently asked questions. Different AI tools are “trained” for different purposes. Google’s incubator Jigsaw launched Perspective to combat trolls. It is “an early-stage technology that uses machine learning to help identify toxic comments,” according to Google’s blog post announcement. Deakin University uses AI for student support services, and a Georgia Tech professor prepares for his third semester with “Jill Watson”, an artificial intelligence teaching assistant that answers questions for online students. Georgia State University has seen great benefits from using AI for GSU admissions. 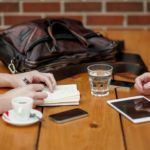 According to a blog posting, of the 50,000-plus student messages received, less than one percent required the attention of Georgia State staff—the rest were handled by Pounce or AdmitHub’s staff overseeing the virtual assistant’s learning process. AdmitHub is an edtech startup that’s creating conversational artificial intelligence (AI) to guide students to and through college. With these virtual assistants, students can now receive 24/7 assistance to FAQs in order to get the help they want when it’s needed the most. Questions can also be routed to the right advisor or staff member who can offer a human touch. Most of the communication takes place through SMS text messaging or other messaging platforms (like the discussion board in a LMS). The more students communicate with the system, the greater the knowledge base grows, and the “smarter” the AI assistant becomes. Virtual teaching assistants were recently recognized as one of the most transformative technologies to impact college within the past 50 years by the Chronicle of Higher Education. 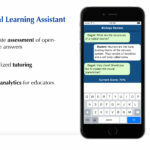 While some artificial intelligence (AI) solutions purposes are broad, such as Apple Siri, Google Now, Amazon Alexa, IBM Watson, and Microsoft Cortana, a unique and specific solution, a Virtual Learning Assistant (VLA), has been exclusively developed to improve education. Through a US government grant, Cognii is developing “leading edge assessment technology to evaluate essay-type answers for online learning platforms.” This intelligent learning and assessment engine can be integration through an API into all online learning platforms including LMS and MOOCs as well as Open Course. It has been implemented with great success at universities including California State University East Bay and Colorado State University. Research validates that some of the most proven practices for improving engagement, learning, and retention are more-frequent formative assessments, writing-to-learn, open response assessments, and one-to-one tutoring. These practices, however, are generally dependent upon access to a well-trained human to guide, grade, and accomplish. 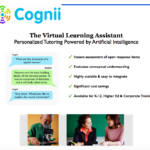 Using the most advanced Artificial Intelligence (AI), Natural Language Processing (NLP), Machine Learning, and Cognitive Computing technologies Cognii’s Virtual Learning Assistant (VLA) solves this costly need. 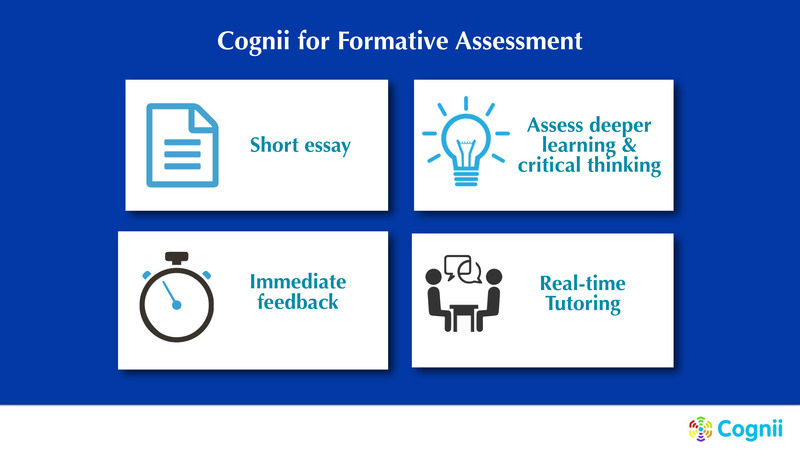 Cognii gives customized feedback and engages students in active learning and helps improve their knowledge retention. Their solution provides one-to-one tutoring, open-response questioning, instant feedback, and conversation until the student has mastered the concept. It then delivers instant scoring at human-level performance. 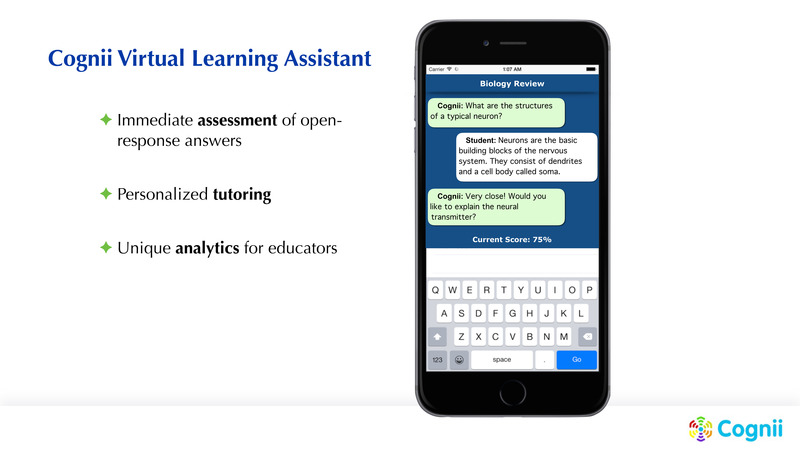 By automating assessment and feedback, Cognii’s VLA makes it possible for students located anywhere to learn any topic. Some of the most prominent universities and colleges are using VLA and seeing a 95% satisfaction rate from students. How Does this AI System for Education Work? Currently, the company works with educators, experts and course designers to develop a curriculum script for identified topics. By using NLP algorithms, the script is mapped to a proprietary format and deployed on the institutions Learning Management System (LMS). Students take advantage of this interactive self-paced learning environment as a course progresses. As students answer questions, they receive immediate assessment, qualitative hints, feedback, and guidance. The process continues, eliminating any missed concepts until the student achieves mastery. Not only is this proving to be a valuable tool for students, but faculty are benefiting from the administrative dashboard, which makes monitoring each student’s progress easy. The rich analytics lets a professor know where a student needs more attention and identifies where curriculum might need to be adjusted based on which concepts are more difficult for the majority of students to grasp. A favorite benefit of using AI is that it can grade a large number of short essays within a few minutes. It is no wonder why Cognii has won several awards including the University of Pennsylvania’s Reimagine Education Best Learning Assessment Innovation Award and MASSTLC EdTech Innovation of the Year Award. With artificially intelligent solutions like these, educational institutions can streamline work processes while providing richer experiences for students.